In recognition of his entire artistic achievement, enormous contribution to the development of exhibition architecture, efforts undertaken to support other artists, to disseminate, protect and promote culture in the field of contemporary art, the jury of the 2014 Katarzyna Kobro Award wishes to honour Robert Rumas, a very humble artist, remaining outside any system. As an artist, Robert Rumas, undertakes the theme of society as a victim, in the perspective of quasi-religious, ultra-catholic, nationalist, aesthetic notions, as well as denominational excess and deficit. He clearly criticises Polish devotional tradition, at the same time taking risk and defending his stance. Religion is here only a griping scheme for further considerations over exhibitional sense, not less important than politics, which nowadays proves to pose a real threat for the freedom of expression. Robert Rumas has been active for 15 year in organisation of exhibition space, scenography for multimedia and theatrical productions. In the 1990s he was a father figure and a source of inspiration for younger generations of artists. Always present, sharing his knowledge with young generation, as well as with those already to some extent shaped as artists. The idea of the annual Katarzyna Kobro Award, presented to an artist chosen by his/her peer-artist, came from Józef Robakowski and Nika Strzemińska (Katarzyna Kobro and Władysław Strzemiński’s daughter). The Award is meant to honour artists demonstrating creative artistic pursuit and progressive stance. Originally the patron of the Award was Galeria Wschodnia, and since 2011 the event has been organised by Muzeum Sztuki in Łódź. 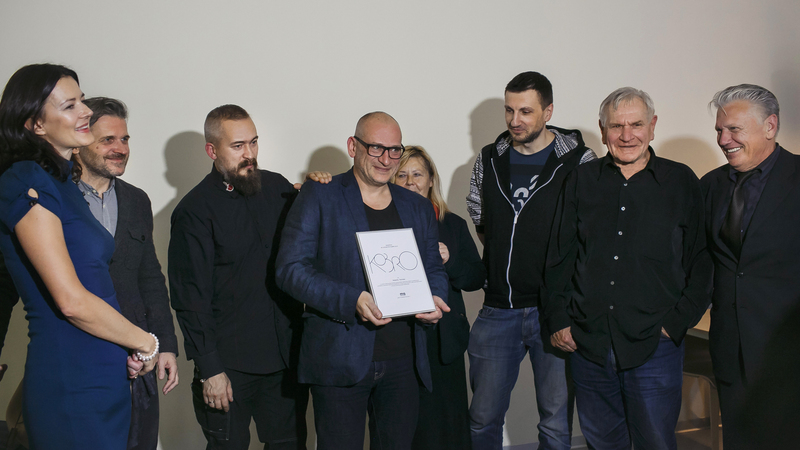 In 2015 the Katarzyna Kobro Award was supported by Alina and Jerzy Pachońscy, the owners of the LOGOGIFT.PL brand.